Ok so before I get started with today’s post, I just want to say that I am not claiming to be a fitness or health blogger by any means, I just thought I would share with you the first day of my detox and how it impacted my Monday! 1. I had a very ‘toxic’ weekend in terms of alcohol and fatty food. Yes it was great fun however it was also the third consecutive weekend that this has happened, so I figured my poor body could do with some re-balancing! 2. I have had some minor medical issues lately and this has taken its toll on my skin, which I personally felt looked tired with blemishes appearing (not good!) so a bit of nourishment should fix this, well finger’s crossed. 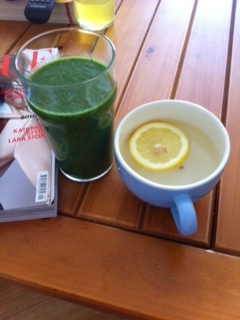 To start the day off I had a kale and spinach shake, with a hot water and lemon. I’m not going to lie and say it was as appealing as a strong coffee and toast. I was however feeling quite determined so I managed to convince myself I was satisfied afterwards. Lunch was suppose to be bigger however I was quite busy so I had a large mixed fruit bowl which consisted of strawberries, grapes and blueberries. 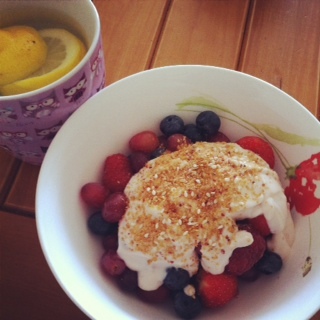 This was then topped with some non fat Greek yogurt and linseed. These two are great for perfecting any imbalances in your digestive system (apparently!) This may seem like a very sugar intensive meal however it was full of good sugar and really satisfied my sweet tooth. I’m not going to lie, dinner was tough. I wasn’t making dinner just for myself so it wasn’t the easiest to make my one whilst looking at his! I did however avoid temptation of eating off the other plate! For my own dinner I made grilled prawns with vegetables stir fried in coconut oil. I added some baked sweet potato wedges to ensure I stayed full! Sorry forgot to take a pic of my dinner! I am terrible for eating late at night, I could easily eat a full packet of biscuits or a shocking amount of chocolate without even realizing! So today I replaced my beloved late night snacks with a ‘clear skin’ smoothie. 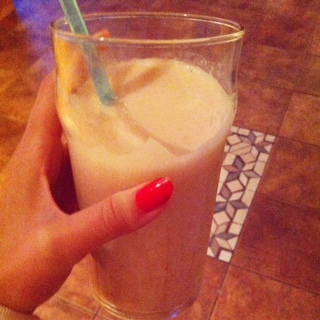 This consisted of: 1 banana, 1 orange, 1 glass of soya milk and 1/2 cup of water. I also added 3 strawberries just because I love the taste. I am going to finish the night with a cup of green tea or a lemon in hot water and I am going to avoid the kitchen as much as possible!! This entry was posted in Hair & Beauty and tagged detox, digestive problems, digestive system, fitness, fresh, fruit, good skin, happiness, health, healthkick, positivity, protein, shakes, skin problems, skin remedies, smoothies by ZOELEXA. Bookmark the permalink.